Cutaneous hyperchromia of the orbital region is characterised by bilateral darkening of the eyelid and orbital skin that contrasts with the adjoining facial skin. It is also known as periorbital melanosis, dark circles, infraorbital pigmentation, idiopathic cutaneous hyperchromia at the orbital region (ICHOR). Hyperchromia of the orbital region can be subdivided into primary and secondary types. The first type is ICHOR, which is characterised by bilateral darkening of the eyelid and orbital skin that is not secondary to systemic or local diseases. The second type is hyperchromia associated with systemic or local diseases of a known cause. It affects individuals of any age, both genders and all races. The condition worsens with skin sagging and abnormal lipid deposits that appear later in life. It is aesthetically very annoying. Dark circles interfere with the face appearance, giving the patient a tired, sad, or hangover look, which often causes difficulties in societal acceptance and may impact quality of life. ICHOR does not have a clear etiopathogenesis. Several aetiological factors have been suggested: genetic transmission, excessive sun exposure, endogenous or exogenous estrogens and progestagens, pregnancy, post-inflammatory hyperpigmentation, excessive subcutaneous vascularisation and hypertransparency of the skin, periorbital oedema and herniation of the eyelid skin fat. Evaluating the concentration of melanin and haemoglobin in dark circles is important to better understand ICHOR. 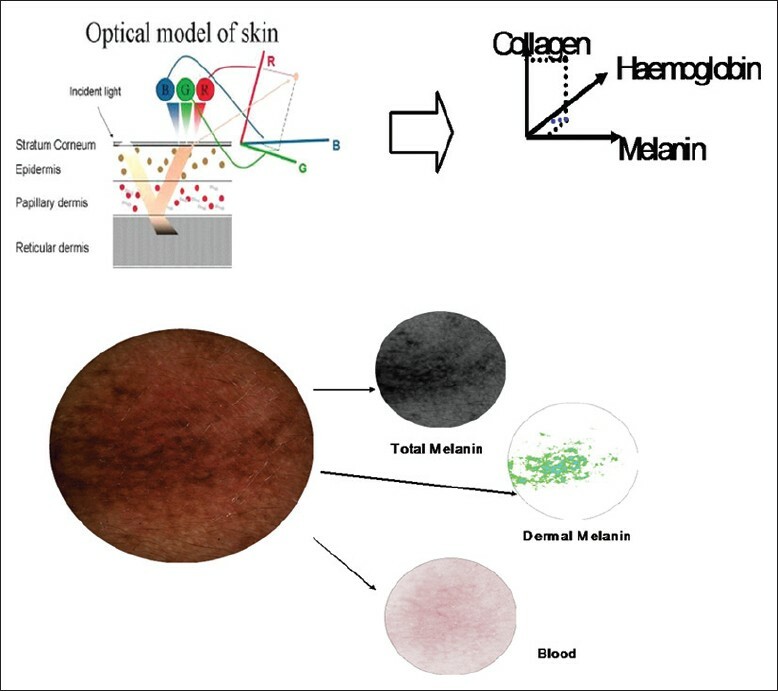 Objective and non-invasive methods are needed to measure melanin concentration in vivo in human skin. The current methods are limited by lack of specificity and inability to resolve spatial distribution of the perplexing chromophore, haemoglobin. A new device, SIAscopy (spectrophotometric intracutaneous analysis (SIA)), ,,, has been developed by Cotton and Claridge  then Astron Clinica (Cambridge, UK), providing an objective non-invasive method to measure melanin concentration in vivo. It allows the concentration and distribution of eumelanin, oxyhaemoglobin and dermal collagen to be measured in vivo. The aim of this investigation was to study the epidemiology, clinical features and risk factors associated with ICHOR in Indian patients and also to study the distribution of melanin and haemoglobin in ICHOR patients with SIAscopy technique. Patients with dark circles were recruited at the Department of Dermatology and Venereology, All India Institute of Medical Sciences, New Delhi, India. A total of 33 patients (11 males, 22 females) with ICHOR diagnosed by clinical examination were included in the study. Patients suffering from pigmentary dermacations lines were excluded from the study. Mean age was 28 years (range 14-48 years). Among the study patients, 18 had previously experienced treatments of dark circles. All patients were of phototype ≥ IV. All patients gave written informed consent. The study was approved by the Institute's ethics committee. Epidemiological data were investigated through a self-administrated questionnaire. Information regarding the duration of outdoor activities and sun exposure before and after onset of ICHOR, the extension of ICHOR lesions and the co-morbidity of ICHOR with other disease such as melasma was collected. Full face standardised photos of all patients were taken with Canfield VISIA CR® device (Canfield Imaging Systems, Fairfield, USA). Three types of photographs were systematically made: Standard flash, Cross Polarised and Ultra violet-A (UVA) lightening. Those three types of photograph allow skin pigmentation to be examined. The standard flash type is close to clinical observation; the cross polarised type allows the effects of surface such as brightness to be suppressed and skin pigmentation to be more precisely visualised; the UVA lighting allows superficial melanin to be brought out. Spectrophotometric intracutaneous analysis (SIAscopy) is a method of analysing pigmented skin lesions non-invasively. Compared with dermoscopy which highly depends on the skills and experience of the examiner, SIAscopy is based on objective features such as the presence of dermal pigment, vascularity of the lesion and the integrity of collagen. The SIAscopy technique was used to study melanin and haemoglobin distribution within the skin.The technique is based on a unique combination of dermatoscopy, contact remittance spectrophotometry and hyperspectral imaging. SIA analysis arose from research undertaken at the University of Birmingham in the UK where the colours arising from skin lesions were being investigated with the aim of identifying objective diagnostic information. In short, the SIAscope is able to obtain a high resolution composite white-light image of the skin over a defined area and provides four additional, mutually exclusive chromophore maps that show the concentration of melanin in epidermis and haemoglobin, collagen and melanin in the papillary dermis, pixel by pixel [Figure 1]. In our study SIAscopy measurements were done on dark circles (left and right side), and normal skin on the cheek of each patient. The mean length of ICHOR in the 33 study patients was 13 years (range 2-48 years). Seventeen patients had dark circles for less than 10 years, nine patients for a time length between 10 and 20 years and seven patients for more than 20 years. The latter showed dark circles with the largest surface area. Family history was also recorded. Among 33 patients 7 had family history of ICHOR. The extension of dark circles to the cheekbone and sides of the face was not linked to family history of dark circles. Patients were also questioned and examined for personal history of contact dermatitis and atopic dermatitis. Out of 33 patients, 7 patients had contact dermatitis of the eyelids, 5 had atopic dermatitis and 1 patient had both contact and atopic dermatitis. Contact dermatitis and atopic dermatitis were not correlated with ICHOR extension. It was striking that none of the patients with atopic background showed extensive dark circles. We found no correlation with hormonal factors: pregnancies, menstruation, contraception and menopause and no correlation with drug intake. Regarding UV light exposure, on average the patients had been exposed for more than 22 hours per week before the onset of dark circles. The majority of patients reduced the number of hours of outdoor sun exposure after the onset of dark circles. The mean time of sun exposure was dropped to 14.3 hours per week. Dark circles could be graded according to four severity grades (1 to 4) and it was found that the mean average sun exposure for patients with grade 3-4 was 16.5 hours per week (18 patients) whereas it was 20.5 hours per week for patients with grades 1 and 2 (n = 13). Among the explored risk factors, Melasma co-morbidity was checked. In fact, among 33 patients with dark circles, only 9 patients had a concomitant melasma. Typical photographs were obtained with the Canfield VISIA CR ® device. Dark circles are well visible. For darker skin types, UVA light does not distinguish DC from the rest of the face since melanin is highly present across the face [Figure 2] and [Figure 3]. Each SIAscan (haemoglobin, total melanin and dermal melanin; collagen was not analysed) was converted into grey levels and the mean of grey levels is calculated. The mean of Grey levels is inversely proportional to the concentration of each component. The results of SIAscan allowed us to compare the content of epidermal melanin, total melanin and haemoglobin in dark circles and in normal skin (cheeks) [Table 1]. The SIAscopy results show that total melanin and dermal melanin contents are higher in dark circles than in normal skin. The content of dermal melanin is particularly low in normal skin. It is higher in dark circle skin, but a high variability is noted [Figure 3]. As regards haemoglobin content, it is also higher in DC skin than in normal skin. Although ICHOR is considered as a disorder within the limit of physiology, patients, especially women, are really bothered and concerned about it, even relating a significant impairment on their quality of life owing to the presence of dark circles. Our study shows surprising epidemiological results compared with the literature. They have to be confirmed in a larger study. No significant correlation between ICHOR prevalence and family history has been found, and the extension of lesions does not appear to be linked to a family history. In contrast, there are studies showing the evidence of a family character, with dominant autosomal inheritance and variable expression of the genes involved. ,, In 1962, Hunzinker  described a family whose 10 members were affected by ICHOR, including an 8-year-old girl. Goodman and Belcher  reported 22 individuals with ICHOR affecting six generations of a single family. Subsequently, they described three other families, one included 11 members with ICHOR over two generations. In 1969, Maruri and Diaz  described 20 affected individuals over three generations of another family. Nevertheless, there is no concrete evidence that might confirm genetic transmission, and it does not emerge from our study. Whereas post-inflammatory hyperpigmentation is believed to be secondary to atopic or allergic contact dermatitis, , we have not found here any correlation between extension of dark circles and atopic and contact dermatitis. Our study also does not give evidence of any correlation with contemporaneous melasma as only 9 patients out of 33 had melasma. No involvement of ICHOR with hormonal factors, such as pregnancies, menstruation, contraception, menopause, etc., has been identified. Nevertheless this study confirms that sun exposure is a risk factor of dark circles aggravation. Indeed patients tend to reduce sun exposure after the onset of dark circles. This is confirmed by correlating the severity grade with current time of solar exposure: the more severe dark circles are, the shorter current sun exposure time is. SIAscopy analysis reveals significant differences in the content of total melanin, of dermal melanin and of haemoglobin between ICHOR skin and normal skin of the same patient. This confirms that melanin deposits and the presence of blood in dark circles may play a role in ICHOR pathogenesis and cause the darkening of skin under eyes. The majority of the histological studies on ICHOR have shown the presence of melanin inside dermal macrophages which seems to be an important factor in hyperchromia genesis of the periorbital skin. ,,, The disorder seems to consist of pigment incontinence. ,, Histological characteristics of infraorbital darkening suggest that they are caused by multiple etiologic factors that include dermal melanin deposits, post-inflammatory hyperpigmentation secondary to atopic or allergic contact dermatitis, periorbital oedema, superficial location of vasculature and shadowing due to skin laxity. Watanabe et al. studied periorbital biopsies of 12 Japanese patients with DC and showed that all of them had dermal melanosis revealed by histology. According to the authors, melanosis could be interpreted as dermal melanocytosis based on the findings of the anti-S100 protein and Masson-Fontana silver staining. However, if melanocytosis is a fixed finding, what could explain the daily fluctuation in these patients' condition? The authors speculated that thickening of the dermis, caused by oedema, led to an enhanced incidence of diffused light reflection from the pigments resulting in increased darkness of the skin. They came to this conclusion based on the works by West et al. 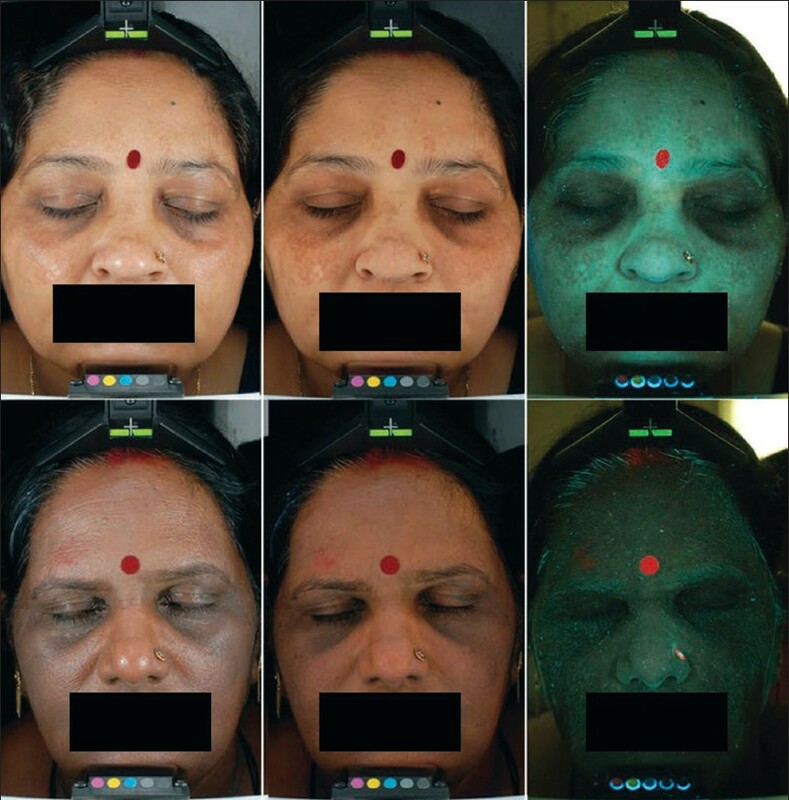 who successfully treated infraorbital pigmentation using carbon dioxide (CO 2 ) laser, without any corresponding improvement in melanin spectrometric readings. The latter authors speculated that the efficacy of CO 2 laser depended on the tightening of dermal tissues and improvement in the skin surface texture, which caused the Tyndall effect. Therapeutic options are still limited and most of the time unsatisfactory. The presence of dermal melanin could explain the difficulties to obtain good results. However a study by Elson  that evaluated the use of vitamin K combined with retinol 0.15% for the treatment of periorbital hyperpigmentation demonstrated that this preparation was effective in improving under-eye circle in 93% of the patients. For now, it seems certain that the best treatment options at patients' disposal are sunscreens and increased rest. SIA provides objective information regarding skin colour. Indeed when we assess skin pigmentation subjectively by eye it is always confounded by the presence of haemoglobin. In simple terms, while the human eye has superb contrast sensitivity  (down to only 2% of full brightness) and can distinguish adjacent browns and reds with ease, it becomes virtually impossible to separate visually and/or communicate reliably the relative contributions of melanin and haemoglobin when they overlay one another, as is the case both in young or photoprotected skin (very homogeneous distribution of each chromophore) and in older photodamaged skin (e.g. co-location of telangiectasia and lentigos or diffuse hyperpigmentation). Visual assessment, therefore, is at best semiquantitative and certainly not linear. Objective approaches to determining skin colour in vivo centre on spectrophotometric or colorimetric ones and the use of derived colour coordinates, various digital imaging and image analysis techniques, reviewed in full by Pierard. SIA provides objective diagnostic information with the investigation of colours arising from skin lesions. ,, It has become apparent that analysis of purely visual colour information is insufficient to extract reliable diagnostic information relating to the lesion's internal structure and that it is necessary to extend the analysis into the infrared to extract such information. The result of this research is a technique capable of rapidly imaging a skin lesion in vivo and allowing the distribution, location and quantity of a range of chromophores, including melanin, blood and collagen within the papillary dermis and the location of melanin relative to the dermal epidermal junction to be examined. The clinical device based on this technique is termed a SIAscope and it returns SIAgraphs showing those constituents for interpretation and for ICHOR diagnosis. Astron Clinica has developed Non contact SIAscopy™ (NCS) that overcomes the limitations of a skin contact probe. NCS is implemented  using an essentially conventional (although finely calibrated) digital camera and lighting system and may be used to acquire large-field eumelanin and oxyhaemoglobin chromophore maps. In conclusion, our results show that SIAscopy can be used as a useful tool to provide diagnostic information about ICHOR. The accuracy of identification of the chromophores melanin, haemoglobin and collagen using SIAscopy is extremely high. The presence of melanin deposits and presence of blood stasis in dark circles may play a role in its pathogenesis and cause the darkening of skin under eyes. SIAscopy is of major help in providing objective diagnostic information about dark circles. Despite their prevalence and cosmetic importance, there are few reported studies in the scientific literature about dark circles. Even a good definition of this condition is lacking. As there is neither a general understanding about dark circle pathogenesis nor a consensus about the major responsible features, treatments are chosen in a simplified way, thus giving suboptimal results most of the time. It is important to identify the specific anatomic problem of each patient in order to individualise treatment. No study has ever investigated the levels of melanin, haemoglobin and collagen using SIAscopy. This is the maiden attempt on the status of melanin, haemoglobin and collagen in ICHOR patients using SIAscopy. This study may add some insight in explaining the role of melanin and blood in the pathophysiology of ICHOR. Further studies in a larger patient cohort might verify whether investigation of these chromophores using SIAscopy may help in identifying objective diagnostic information in patients with ICHOR. We would like to thank Laurent Petit from Galderma Recherche for his help regarding SIAscopy measurements and statistical analysis. 1. Graziosi AC, Quaresma MR, Ferreira LM, Michalany NS. Histopathologic study of cutaneous idiopathic hyperchromia of the orbital region. Dermatol Surg [in press]. 2. Yaar M, Gilchrest BA. Skin aging: Postulated mechanisms and consequent changes in structure and function. Clin Geriatr Med 2001;17:617-30. 3. William J, Berger T, Elston D. Andrews' diseases of the skin: Clinical dermatology. 10 th ed. Philadelphia: Saunders; 2005. 4. Aguilera Díaz L. Pathology and genetics of bipalperbral hyperpigmentation. Actas Dermosifiliogr 1971;62:397-410. 5. Maruri CA, Diaz LA. Dark circles around the eyes. Cutis 1969;5:979-82. 6. Winkelmann RK. Dark circles under the eyes. JAMA 1965;193:161. 7. Marks MB. Allergic shiners. Dark circles under the eyes in children. Clin Pediatr (Phila) 1966;5:655-8. 8. Bingel A. Heritability. Eugenics and population policy. Münch Med Wschr 1937;84:1531-2. 9. Garcia A, Fulton JE Jr. The combination of glycolic acid and hydroquinone or kojic acid for the treatment of melasma and related conditions. Dermatol Surg 1996;22:443-7. 10. Lowe NJ, Wieder JM, Shorr N, Boxrud C, Saucer D, Chalet M. Infraorbital pigmented skin. Preliminary observations of laser therapy. Dermatol Surg 1995;21:767-70. 11. Elson ML, Nacht S. Treatment of periorbital hyperpigmentation with topical vitamin K/vitamin A. Cosm Dermatol 1999;12:32-4. 12. Touraine A. Dermatoses: Symptomatic visceral lesions. Surgical Medical Encyclopedia, Dermatology 1937;2:14. 13. Ohshima H, Takiwaki H. Evaluation of dark circles of the lower eyelid: Comparison between reflectance meters and image processing and involvement of dermal thickness in appearance. Skin Res Technol 2008;14:135-41. 14. Boxrud C, Shorr N, Stensapir K. Management of dark circles around the eyes. In: American Society of Ophthalmologic Plastic and Reconstructive Surgeons. Chicago; 1993. p. 129. 15. Epstein JS. Management of infraorbital dark circles. A significant cosmetic concern. Arch Facial Plast Surg 1999;1:303-7. 16. Elson ML. Evaluation and treatment of the aging face. New York: Springer-Verlag; 1994. p. 1-8. 17. Duke-Elder S. The eyelids. The ocular adnexae. In: Duke-Elder S, editor. Text of ophtalmology. St Louis: Mosby; 1952. p. 364-71. 18. Goodman RM, Belcher RW. Periorbital hyperpigmentation. An overlooked genetic disorder of pigmentation. Arch Dermatol 1969;100:169-74. 19. Hunzinker N. About familial hyperpigmentation of eyelids. J Génét Hum 1962;11:16-21. 20. Miescher G, Stork H. Pigment incontinence of xanthoma palpebrarum. Dermatologica 1951;102:366. 21. Jadassohn W, Franceschetti A, Golay M. Clinical comments on skin pigmentation. Dermatologica 1954;108:225-34. 22. Cotton SD, Claridge E. Developing a predictive model of human skin colouring. Proc SPIE 1996;2708:814-25. 23. Cotton SD, Claridge E, Hall PN. Non-invasive skin imaging. In: Duncan J, Gindi G, editors. Proceedings of Information Processing in Medical Imaging. London: Springer-Verlag; 1997. p. 501-6. 24. Moncrieff M, Cotton SD, Claridge E, Hall PN. Spectrophotometric intracutaneous analysis-a new technique for imaging pigmented skin lesions. Br J Dermatol 2002;146:448-57. 25. Cotton SD. A non-invasive imaging system for assisting in the diagnosis of malignant melanoma. PhD thesis. UK: Birmingham University; 1998. 26. Watanabe S, Nakai K, Ohnishi T. Condition known as "dark rings under the eyes" in the Japanese population is a kind of dermal melanocytosis which can be successfully treated by Q-switched ruby laser. Dermatol Surg 2006;32:785-9. 27. West TB, Alster TS. Improvement of infraorbital hyperpigmentation following carbon dioxide laser resurfacing. Dermatol Surg 1998;24:615-6. 28. Campbell FW, Robson JG. Application of fourier analysis to the visibility of gratings. J Physiol 1968;197:551-66. 29. Pierard GE. EEMCO guidance for the assessment of skin colour. J Eur Acad Dermatol Venereol 1998;10:1-11. 30. Preece S, Cotton SD, Claridge E. Imaging the pigments of skin with a technique which is invariant to changes in surface geometry and intensity of illuminating light. In: Barber D, editor. Proceedings of Medical Image Understanding and Analysis. Malvern: British Machine Vision Association; 2003. p. 145.